DENVER, CO, February 10, 2018 /24-7PressRelease/ — Volume I of the Bedside Critical Care Manual has been published by Foolscap & Quill. Edited by Edward D. Chan, M.D., Lance S. Terada, M.D., John B. Kortbeek, M.D., FRCSC, FACS and Brent W. Winston, M.D., FRCPC, FACP, FCCP, FCCM, this expanded edition of the Bedside Critical Care Manual includes chapters on Acid-base Disorders, Cardiology, Intravenous Drug Dosages, Electrolyte Disorders, Endocrinology, Environmental Critical Care, Ethics, Gastroenterology, Hematology, Hemodynamic Monitoring, and Infectious Diseases. This manual includes updated charts, dosages, and diagrams to help clinicians quickly find essential information to treat patients in the ICU. 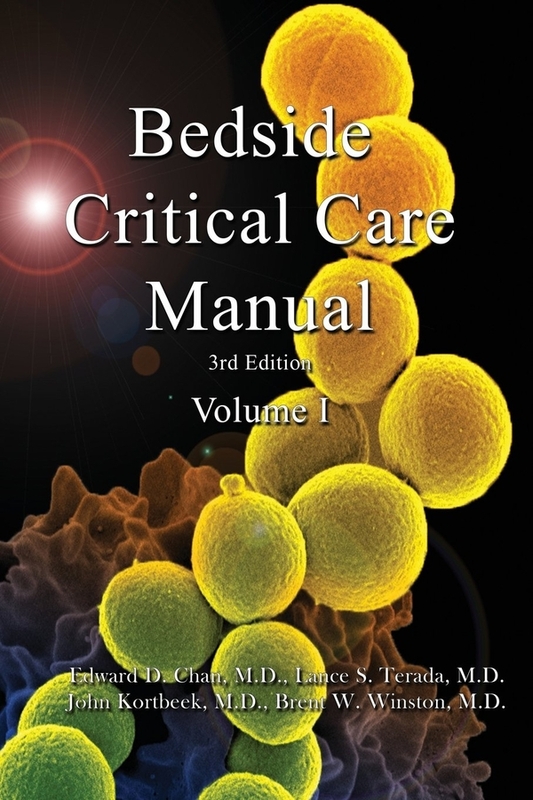 Volume 2 of the Bedside Critical Care Manual will be published in the spring and the manual will be available in ebook format shortly thereafter. Dr. Edward D. Chan, originally from Rangoon, Burma, is a pulmonologist and intensivist in Denver, Colorado. He is a Professor of Medicine at the Denver Veterans Affairs Medical Center, National Jewish Health, and the Division of Pulmonary Sciences and Critical Care Medicine, University of Colorado Denver Anschutz Medical Campus. His research primarily focuses on critical care medicine and mycobacterial infections. His other interests include hiking, reading Sherlock Holmes stories, and caring for his fish, chickens, lizards, and dog Berniece. Dr. Lance S. Terada is an ex-surfer from Honolulu who now directs the Division of Pulmonary and Critical Care at the University of Texas Southwestern in landlocked Dallas. He trained at Case Western Reserve and the University of Colorado. His current research focuses on vascular cell signal transduction and lung cancer epigenetic reprogramming. John B. Kortbeek, M.D., FRCSC, FACS is a trauma surgeon and intensivist at the University of Calgary. He trained in Canada and the United States. He is currently a Professor of Surgery, Head, Department of Surgery, University of Calgary and Alberta Health Services, Calgary Regional Trauma Services, Foothills Medical Centre, Calgary. His research interests include trauma and critical care education and he enjoys teaching. Brent W. Winston, M.D., FRCPC, FACP, FCCP, FCCM, is a clinician scientist who was trained in pulmonary and critical care medicine in Canada. His research training was in Denver at the National Jewish Hospital. His research interests include metabolomics in Sepsis, ARDS and Traumatic Brain Injury at the University of Calgary. He is currently an Associate Professor of Medicine, Departments of Critical Care Medicine, Medicine, and Biochemistry and Molecular Biology, Immunology and Airway Inflammation Research Groups, University of Calgary and Alberta Health Services, Calgary, Alberta, Canada. Foolscap & Quill is a publisher located in Colorado that publishes approximately a dozen books per year in paperback and ebook formats.